The site on the KTH campus, with its very tangible cultural and historical context and its physical limitations, could be described as the opposite of a blank slate (Tabula Rasa). 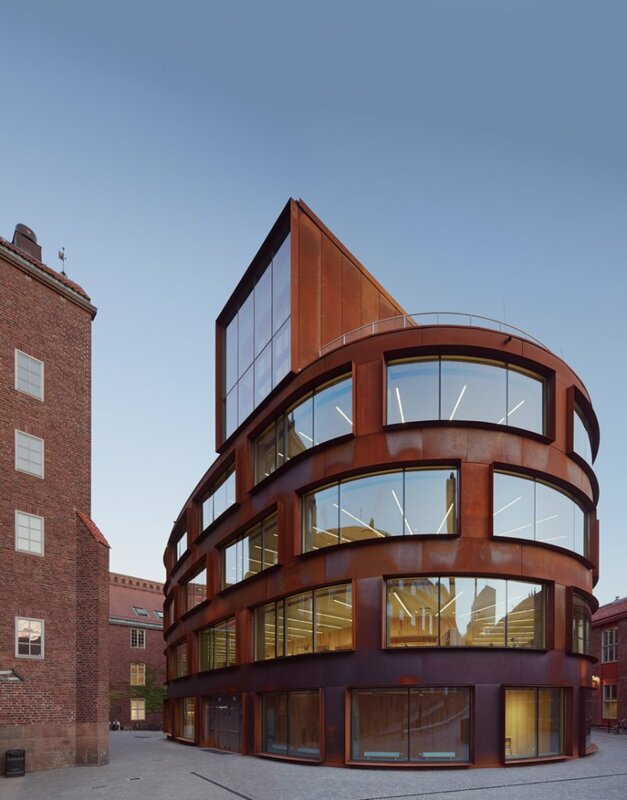 The new school is inserted into an existing courtyard space with existing pathways and is located adjacent to Erik Lallerstedt’s original and quite monumental brick buildings from the early twentieth century. 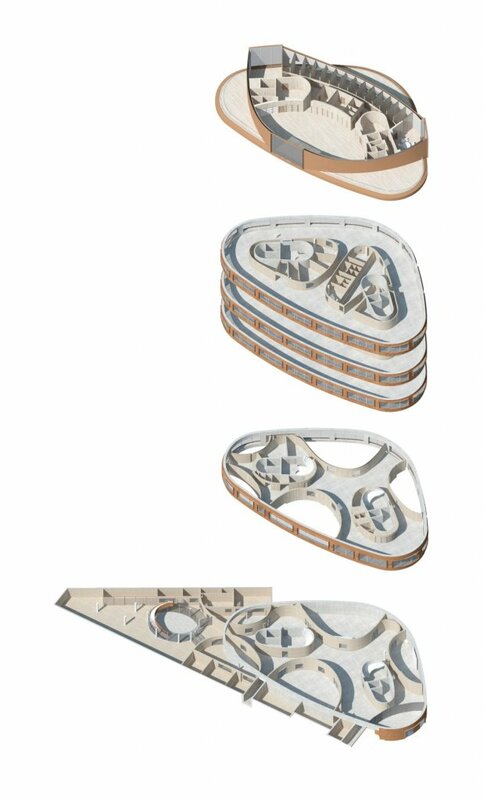 Based on the logic of a free campus layout that encourages movement, the idea is to accomodate and encourage circulation within the building and all around it as a way of thoroughly integrating and anchoring the new school to the site. 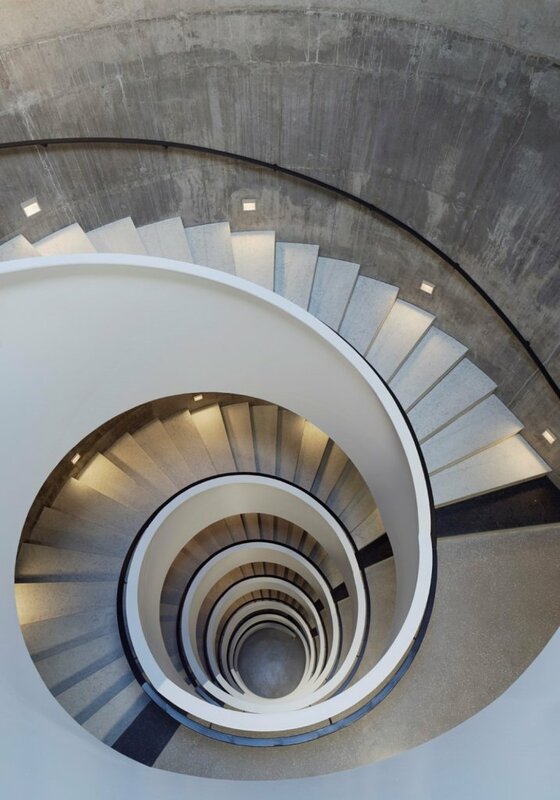 With its rounded contours and a total of six floors, the school building includes a sunken garden and a roof terrace, while cultivating the character of the courtyard as one continuous space. 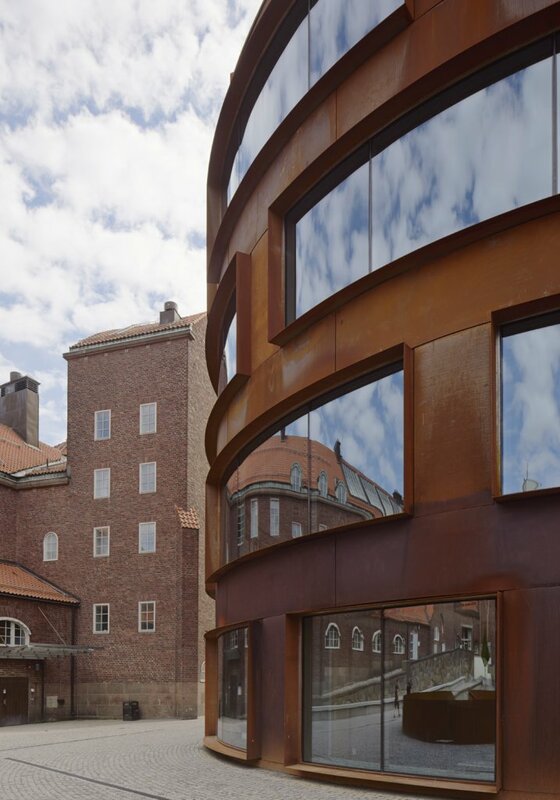 The deep red CorTen steel exterior relates to the dark red brick of existing buildings. The interior is designed to be robust and flexible. 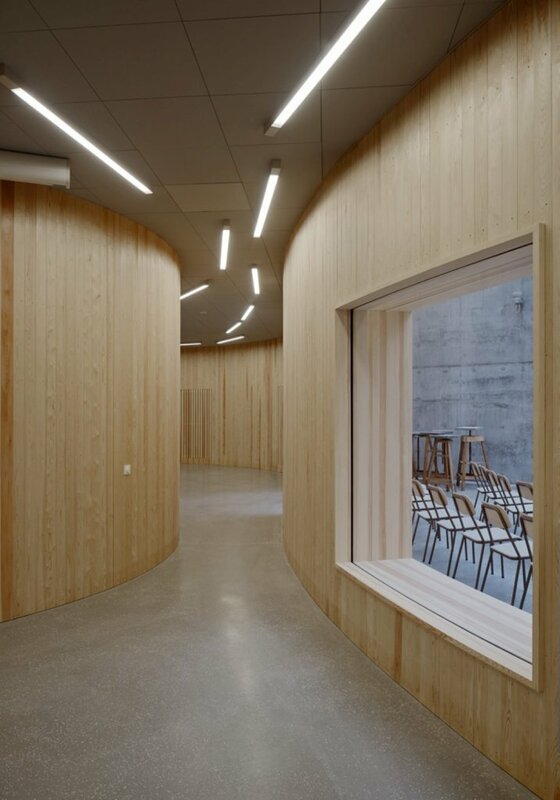 Curving walls create a free flow of contiguous space that enhance the sense of openness rather than enclosure. Views and paths are extended through the structure with spatial conditions more akin to a landscape than a traditional institutional building. 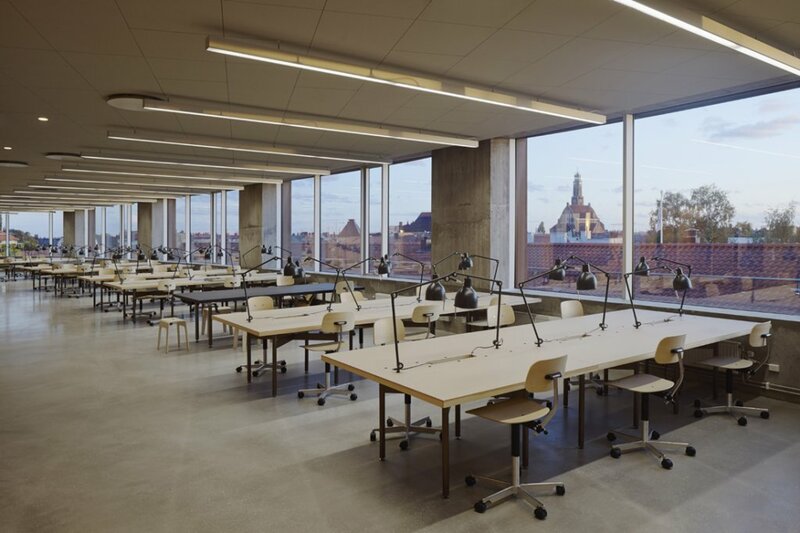 At the entrance level a series of double height spaces, the atelier and exhibition area, designate a generous main entrance that also doubles as an open lecture hall. It is in the form of a broad passage meandering through the building. A deep floor plan creates an opportunity of extensive glass use in the surfaces of the facade. 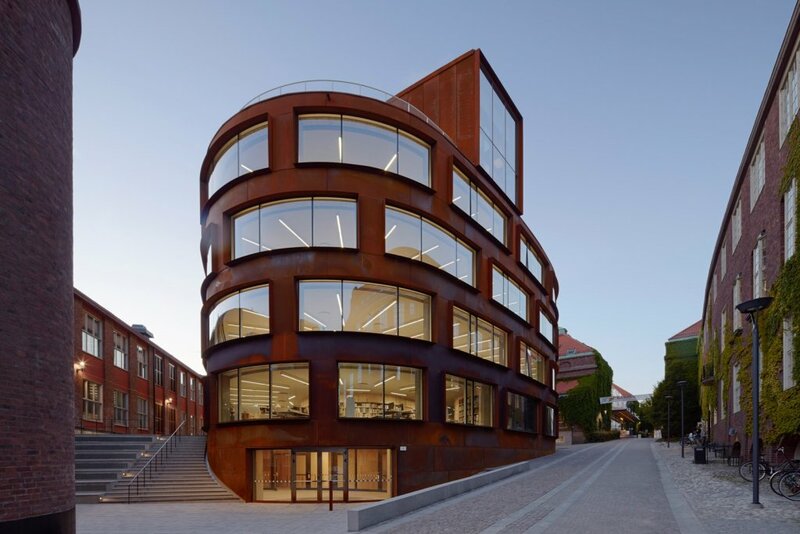 It endows the building with a high degree of generality, offering lavish amounts of light and transparency, while maintaining the climate and energy efficiency of the whole building.